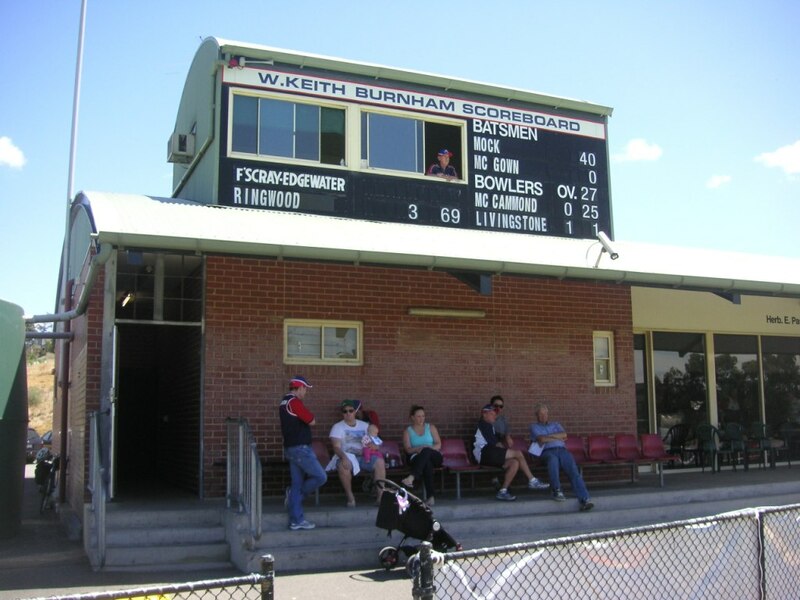 The Mervyn G Hughes Oval in Footscray is home to two award-winning scoreboard attendants. John Lord, who looks after the W.Keith Burnham Scoreboard that’s perched atop the clubrooms, was one of 20 recipients of Cricket Victoria’s 2012 Kookaburra Volunteer Recognition Awards. John received his award at a Boxing Day Test Match breakfast at the MCG on day three of the Test against Sri Lanka. 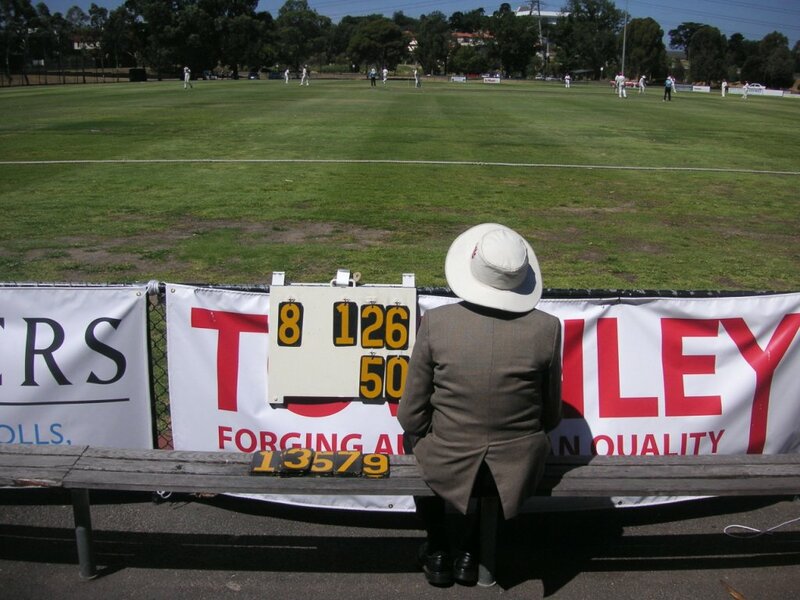 John Alcock, who looks after the smaller scoreboard on the pavilion wing boundary fence, received an award in December 2012 from Maribyrnong Council for his contribution to encouraging involvement in all-abilities cricket. John and John are favourite sons of the Footscray-Edgewater Cricket Club, which fields four teams in the Victorian Premier Cricket competition. John Lord’s award recognised his 20 years of service to the Bulldogs, most of them tending the scoreboard. His first few years of volunteering were the last years of the club at the Whitten Oval (then known as the Western Oval). “I was an onlooker at the Western Oval for a number of years, rubbishing the umpires and opposition players, when I heard the person in the scoreboard had to stand down for family reasons,” explained John during the tea-break of a second X1 game against Ringwood. It wasn’t just a Saturday afternoon commitment for John. On Fridays before each game he would have to paint the names of the opposition players onto boards with whitewash. The next game he would wash off the names and start again. He did, though, enjoy using the old-fashioned roller-numbers. The Bulldogs last cricket game at the Western Oval was in December 1996. The club then moved 12 months later to Farnsworth Avenue, by the Maribyrnong River, just across the road from Flemington racecourse. John Lord has been in charge of the scoreboard since the first game at Farnsworth Avenue in December 1997, always in the company of the scorers, who sit right beside him, and often with the help of Royce Pepin, the club’s major sponsor and number one ticket holder. The scoreboard, named in 2000 in honour of former long-term president W.Keith Burnham, is a tidy, air-conditioned room that seems to pop out of the Herb L. Pascarl Pavilion like bread from a toaster. John’ Lord’s days of vociferous barracking may have been stymied by his scoreboard responsibilities, but you can never quite silence the barracker. As the Footscray-Edgewater second X1 appealed for an LBW John said, not quite under his breath, “Go on and give him out.” And when the umpire duly raised his finger John said “Yes!” and quickly changed the tally of fallen wickets to eight. The cricketers share the oval with Parkside Football Club. John, a life-member of both clubs, has been manning the scoreboard for footy “the past seven or eight seasons”. 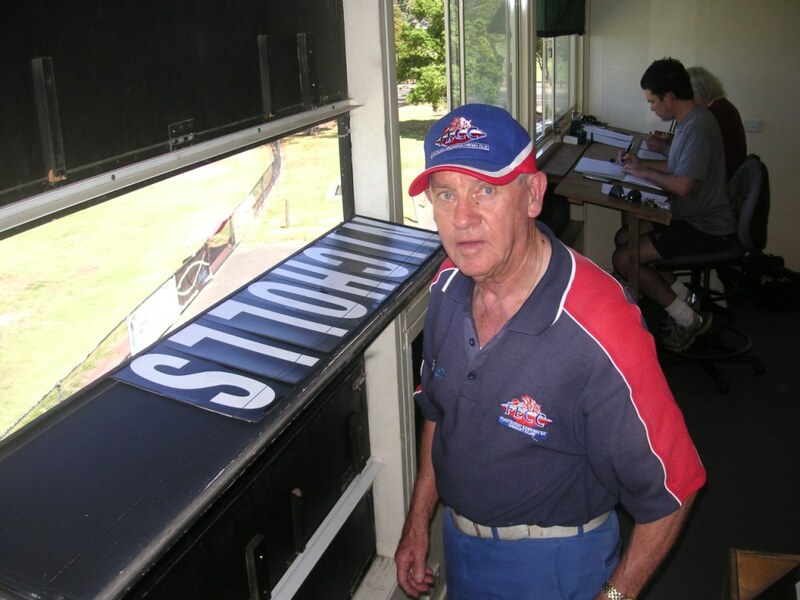 When an injury kept John out of the scoreboard at the start of the 2011-12 cricket season John Alcock proudly stepped in (and up the very steep ladder) to look after the numbers and the names. 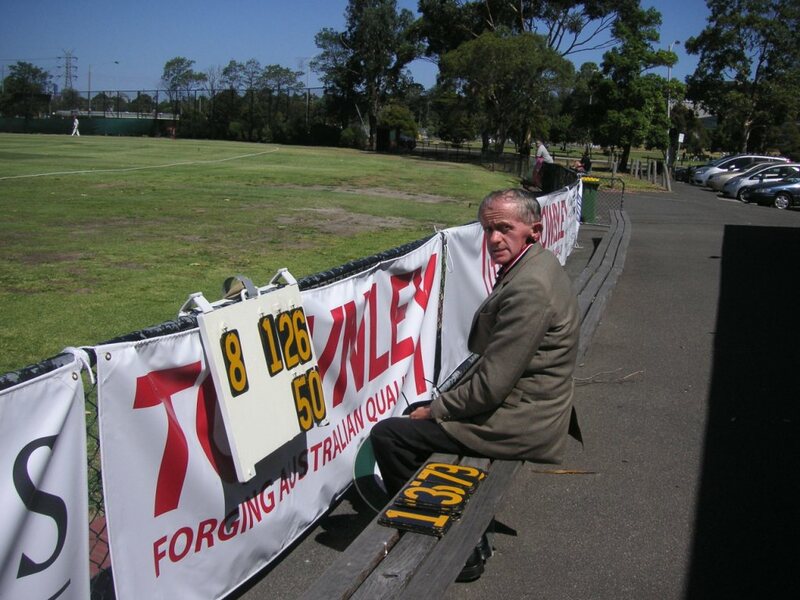 John Alcock is best known around the club for his work, since 2007, looking after the smaller scoreboard that hangs from the fence, facing the spectators. He sits alone and content, every now and then checking the main scoreboard to make sure they are both in agreement. His award from the local Council in December was one of the annual Maribyrnong Inclusive Recognition Awards (MIRA) that honour the achievements of individuals and inclusive community organisations. It was in recognition of his 20 years of playing for and organising the Maribyrnong All Abilities indoor cricket team. John and John were both modest about their awards, John Alcock saying only: “You’ll need to speak to a committee member” and John Lord saying other volunteers were more deserving of recognition. For the record, the scores at the end of the first day’s play in the second X1 match were Ringwood 139 versus Footscray-Edgewater 1/60. Footscray-Edgewater’s Test players are Ron Gaunt, Les Joslin, Ken Eastwood, Ray Bright, Alan Hurst, Merv Hughes, Tony Dodemaide, Colin Miller and John Hastings. 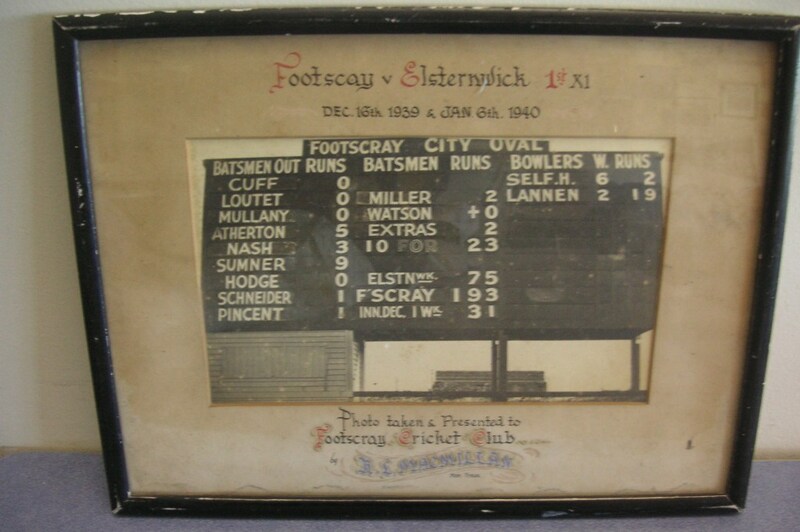 Amongst the club’s memorabilia are some rare photos of the 1940s Western Oval scoreboard, which pre-dated the better-known scoreboard that was at the West Footscray station end of that ground. Way back then the ground was known as Footscray City Oval and Footscray played in the sub-district competition. Postscript: John Lord passed away in early 2018. Great article Vin. Go Bulldogs! You were spot on with Johnnie Lord’s barracking … I went up to the scoreboard for some summer relief … the air-con was as cool as was Johnnie with the form of his Bulldogs!! John Lord and John Alcock embody all which is great about sport: giving so others may perform. I say: how powerful is their contribution? It’s as an important a link in the chain as the players. There’s also a new scoreboard Vin going up at Toorak Park … there’s been a wonderful man running the old one too.